shtumrecords.bandcamp.com/album/shtum-016 Chino from Krakow is one of Poland's most distinctive players when it comes to providing a good amount of darkness into your nightlife experiences. With the Radar crew he's hosting some of the wildest nights of Underground Dance music in Poland. When producing he has a knack for ice cold rhythms and sharp synth lines. His ever-changing, gear-heavy live sets have earned him a reputation as a tour de force in electronic beat music. After EPs for S1 Warsaw, Recognition or Holger he has finally delivered an impressive five-tracker for shtum out of Dresden, a city he maintains a well-established connection to. From the hard hitting rhythms of "Kolaps" to the gloomy sound excursions of "Plattenbau", you'll feel in every note that this music comes straight from the heart. 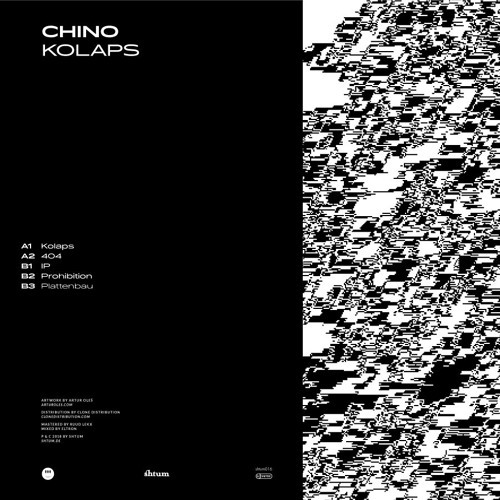 These are tracks that are interwoven by everything that surrounds Chino, whether it's friends, drum machines or FM synths, architecture or just the mighty Tatra mountains. Dance the pain away.